Strong key resistance level is present at 0.7174 price area which is the termination point of Bullish corrective wave ii leg. In my judgment, price action in AUD/USD currency pair is now going to drop more. So, market is going to remain bearish on a short term basis. Next, expects a long term bottom in price action as well after decline. Based on Elliott wave forecast, the current Bearish trend is part of a Bearish corrective Elliott Wave pattern, wave 2 leg in higher time frame. Currently, Bearish impulse Elliott wave iii pattern looks in-complete. So, a good idea is to look for a possible sell trading chance to join the down trend around 0.7115 price area. However; if the price of AUD/USD currency pair breaks above 0.7174 vital resistance level then down trend is going to end. In such a market scenario, it would be best not to trade the Forex market and re-do the AUD/USD Elliott wave analysis in four hours chart. To me; price is printing Bearish corrective wave 2 leg. Now, price action is falling down to complete the Bearish corrective wave 2 Double Zig Zag pattern. So, now market is falling down on a short term basis to complete the Bearish Double Zig Zag wave 2 leg. The Bearish corrective wave 2 leg is the last and final decline and price is going to prints a bottom after that. Next, price action is going to start the bullish impulse wave 3 leg. Within the Bearish Double Zig Zag corrective Elliott wave pattern, all sub-waves must sub-divides into 5, 3 and 5 waves pattern. The following Elliott Wave Bearish Double Zig Zag corrective pattern diagram shows us a completed Bearish double Zig Zag pattern within the frame work of Elliott wave principle. The Double bearish Zig Zag wave pattern of the Elliott wave principle shows that how price action does not moves in a straight line fashion but in a series of highs (rises) and lows (retracements). Bearish double Zig Zag Elliott wave pattern in a down trending market could be seen inside the above image. The figure shows what a double Bearish Zig Zag wave pattern looks like. If a trader knows what a bearish double Zig Zag looks like, then it would become much easy for a currency trader to actually analyze the Forex charts and make a trading decision as well. A Bearish double Zig Zag consists of two Zig Zags Elliott wave patterns, joined by an X wave. We use W English alphabet to label first Zig Zag wave leg and we use Y English alphabet to label second Zig Zag wave leg. Please take a note that Zig Zag pattern is a corrective Elliott wave pattern which appears at a pull back in a main market trend and so the double Zig Zag. Based on my AUD/USD technical analysis using Elliott Wave in daily chart, we have got an in- complete Bearish corrective wave 2 leg and price action is still falling down to completes the Bearish wave 2 corrective leg. However; it is possible if price breaks below green colour support line then forecast will become in-valid. Now, price action is probably going to move sideways and then falls more lower to completes a Bearish Double Zig Zag wave 2 leg. 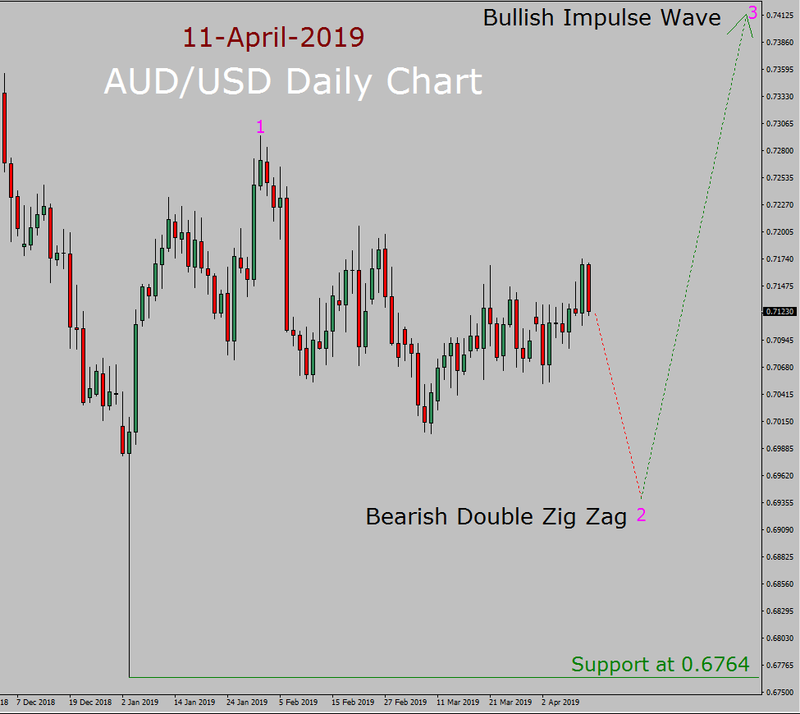 To me; in four hours chart of AUD/USD currency pair the bearish leg – wave i impulse wave which is part of a higher degree wave 2 Bearish leg in daily chart is just a bearish pull back on a smaller degree in an up trend as mentioned above as wave 2 Bearish Double Zig Zag corrective wave pattern inside a daily price chart. Strong key support level is present at 0.6764 price area in AUD/USD daily chart. So, I expect market to first move lower for next coming trading days and then may be starts the rise. So, in my opinion market is going to remain Bearish overall and on a medium term basis, next expects a Bullish leg in market after that in AUD/USD currency pair, in daily chart. Based on AUD/USD Elliott wave Weekly Forecast the trend is up in daily chart and a good idea is to look for a buy trade around 0.6952 price area, as price action is going to rise up more towards 0.7415 but a clear bearish break down in price action below 0.6764 vital support area will end the up trend. On a medium term basis, it is a Bearish trend in AUD/USD 4 hours time frame and a good idea is to take a sell trade around 0.7115 price level and price is probably going to drop down towards 0.7020 price level. However; if the price of AUD/USD currency pair breaks above 0.7174 vital resistance level then Bearish trend is going to end. We recommend trading with these top-rated brokers when using our signals/analyses/forecasts as they handle your trades quicker and more efficiently with very low spreads and most of them have high trade execution rate.